Biography: Elpis Bridge is a Christian faith-based foundation that desires to use education, medical assistance, alimentary aid and other relief as a means of reaching out to the world and spreading the Gospel of Jesus Christ. In 2007 they began in the nation of Botswana and by God's grace and in His time, will go to other nations of Africa. 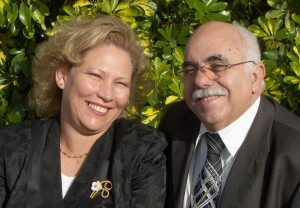 Tony and Johanna spent several years as directors of a home for children, Casa Beulah, in Portugal. The foundations' main focus group is the children of the nations, but they are not the only people helped by the ministry. Tony and Johanna discovered that to help a child, you need to create an environment for that child to abide in safely. They operate a soup kitchen where all destitute children, adults or elderly are invited for one warm meal a day. Elpis Bridge Farm will enable them to grow fruits and vegetables for the soup kitchen. Tony and Johanna also have a cinema where they show Christian movies to the children, a food bank, education work shops, a medical clinic, a radio station and a day care center. Their guiding verse is Proverbs 22:6, Train a child in the way he should go and when he is old he will not turn from it. Strengths: Antonio and Johanna's strength lie in their love for those in need and their ability to get things done. They are gifted administrators. Family: Tony and Johanna have two adult daughters.